What are the best-of-the-best settings for V-Ray? Here it is the solution: universal settings by Chaosgroup. Let’s investigate if these settings can affects aesthetic quality. 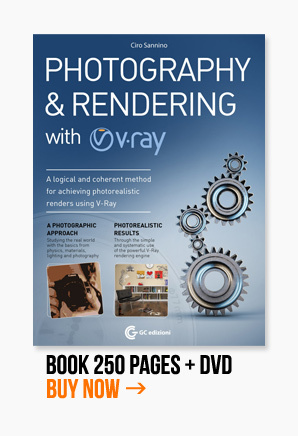 Have you ever rendered with Depth of Field effect in V-Ray? There’s a significant increase in rendering time. We can use an hidden feature called Shademap to reduce time rendering with Dof directly in V-Ray. I always use V-Ray Frame Buffer and would like a specific button to open it fast. But there isn’t yet. So I found a super-simple way to crete if in 1 minute. The exteriors are often lighted by the sun, this light condition is simpler but the problem is the flat lighting. Sun light does not decay so everything appear flatter. In this video tutorial I will show you how to light an exterior just using 1 V-Ray Light with an HDRI in the texture slot. In this post I’m going to talk about how to save memory in order to avoid any crash. 3ds max could crashes during the rendering due to a lack of memory.. so we need to have some strategy to save as much memory as possibile.